April 2012 was the first time Safe Space held the Flamingo Flocking event. Flamingo Flocking in Butte was a great success in 2012, bringing in enough donations to help purchase a much needed new boiler for the shelter. 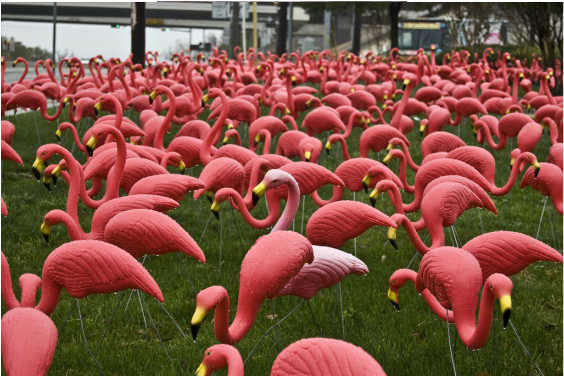 Residents and businesses of the community donate a $20 requested financial contribution to have a friend or family member's yard "flocked with flamingos". The flamingo's land in the yard, then 24 hours later, move on to another location. At the end of the "flocking season", Safe Space hosts a "Flock Party", free admission to the communities we serve, with food and entertainment for those who wish to participate. Be prepared for a bigger and better event this year with excellent items for our live, silent and Dutch auctions, live music, and a lot of fun! If you are a business owner, artist of any craft, or just someone who wants to donate to the cause, we are currently accepting donations for the auctions to be held at the Flock Party, as well as for any drawings/door prizes we may hold. Financial contributions for this event will be used to "sponsor" items/baskets/packages for the auctions. If this is something you are interested in, please contact our Shelter Manager, Sabrina White by clicking here. Check out our sponsors and supporters so far this year (below)... It's exciting to see this list continue to grow! As always, any of our staff is available to answer any other questions you may have about our events. You can reach us by calling 406-782-9807. Thank you for Flocking with Safe Space in 2013! Our flocking season is coming to an end... but don't you fret! Our fun feathered flamingo friends will be flying back to Butte next April! Our volunteer Removal Technicians have enjoyed surprising each of you with the flocks this year. Now it's time to celebrate! Join us for our Flock Party this Saturday, May 4, 2013 at the Copper King Hotel (more information below)! Join us for fun, food and entertainment while supporting Safe Space! COST: FREE TO ALL! But remember to bring your check book to bid on amazing items during our auctions. Live music by local artists, King Friday. Live and silent auctions to help raise funds for Safe Space services and programs. A no-host bar will be available - please drink responsibly. Many more unique and exciting items that we cannot share here! Over 40 Silent Auction Items/Baskets/Packages, over 15 Live Auction Items, and more door prizes and giveaways than we can count! Come visit us and check out the items for yourself on Saturday, May 4, 2013! Thank you to all the individual donors to this event. You are all so amazing and your support is greatly appreciated! Check back often to see who else is joining in on the Flamingo Flock fun or contact our Shelter Manager, Sabrina White by clicking here to commit a donation or financial contribution to this event.